Happy Fall everyone! I have spent so much time traveling and painting this summer that I have hardly had any time to post except on the fly on social media. So these next few posts may actually be a bit of a summer recap. First up, Maine. 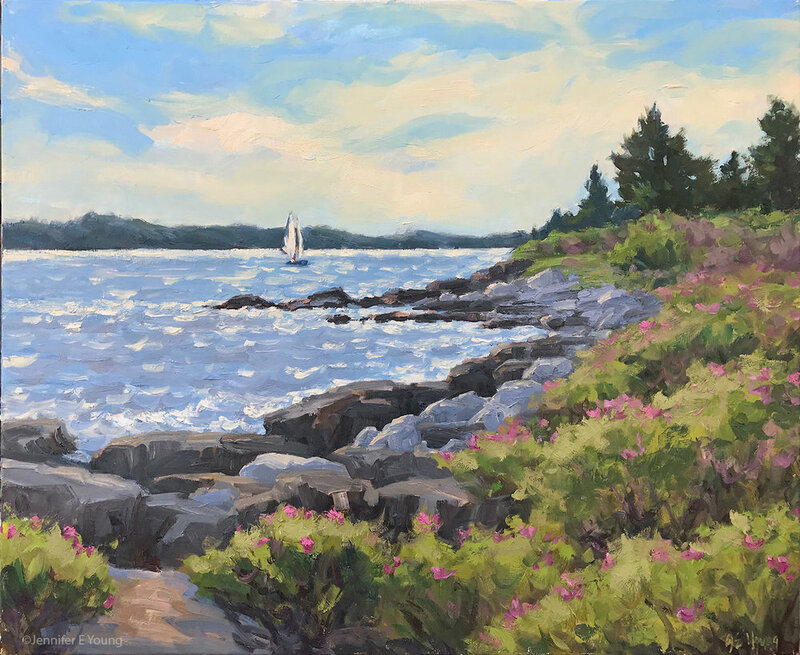 As you may have read here and on social media, I spent a couple of delicious weeks in June painting the Maine Coast during an artist's residency on the island of Vinalhaven. Gallery Flux was kind enough to have hosted a pop-up exhibit of my work for this trip, as well as an artist's talk about my experience painting there. Even though it was a nice and intimate setting, I'm not all that comfortable with public speaking, but I actually had a good time, and the attendees were all very gracious and patient. Thank you to Gallery Flux for hosting me and making this little film. The paintings in this exhibit represent my impressions and experiences from the island of Vinalhaven, Maine, where I was fortunate to have spent a fortnight in June as an artist-in-residence. This video, taken at Gallery Flux in Ashland, Virginia is an artist's talk I gave in conjunction with my September show featuring paintings from my residency. Some of the most romantic and beautiful moments of my Vinalhaven, Maine residency were when I awoke to see the island enveloped in mysterious fog. Attempting to paint that fog from life, however, takes actual work and perseverance. The shifting atmospheric effects on the land and the oh so subtle value ranges require astute concentration and alertness in the midst of the peaceful stillness. Not too far from where I was staying sat a lovely field of wildflowers fronting some wetlands. Purple-violet lupines, as beautiful as any hothouse flower, grow wild throughout the region in spring, as do buttercups, pink clover, daisies, Queen Anne's lace, and numerous other beauties I wasn't able to name. My 11x14" plein air piece (above) found its home on the island, but I wanted to return to that experience back in the studio while my memory of it was still fresh. I painted the larger version with a slightly different angle to include the hint of wetlands in the background in order to give it a better sense of place. Click through on the image below for more info. Going through my notebooks and photos from my Maine trip, I'm made aware of just how many paintings I have swirling around in my consciousness, and never enough time to execute them all. I guess it's better than the alternative of a dry spell, but only slightly less frustrating. The reality is that I'm a mom with a family and a household and a very busy summer on top of it., and since my return from the trip I have had to work in fits and starts, and not without some failure. Still, I do what I can to make time for art. Here's my latest, which was first attempted on site but had to be aborted when the wind turned my painting into a virtual kite! Those boxy shapes you see are lobster cages. They are kind of an iconic symbol to me of this town. Vinalhaven once had its heyday as an island for quarry mining, but workers later turned to lobster fishing for their livelihood. The sun rises at 4:30 a.m., so I was told the fishermen are up by 3:30! Now that's dedication. A far sight more dedicated than I was on the evening I attempted to paint this scene. After my painting did a face plant there was nothing left to do but resign myself to the realities of the wind and eat a delicious lobster roll as consolation. 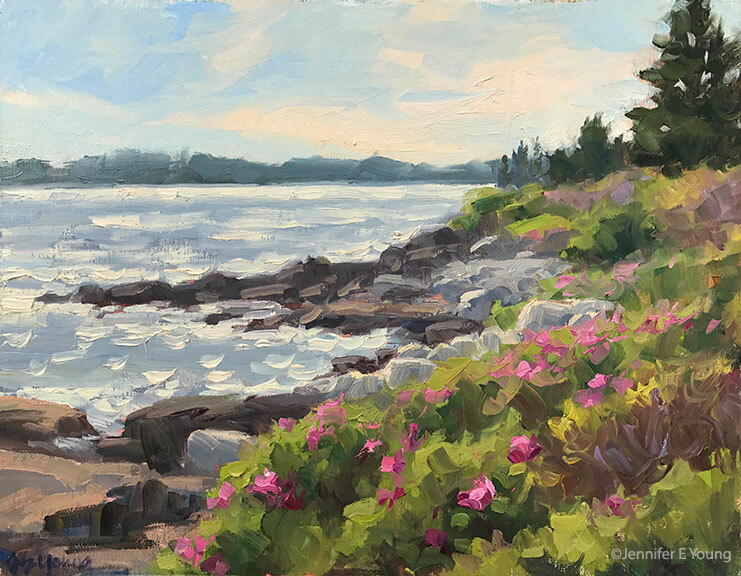 I have another Maine piece on the easel that I'm hoping to complete this week, and then I am off to Floyd, Virginia to paint with my fellow plein air painters in the Floyd Plein Air Festival. This is a week-long event of painting in the mountains, farmland, and vineyards in and around Floyd. I participated in the inaugural event a couple of years ago and we had lots of clouds, wind, and some rain. Here's hoping the weather is a little more cooperative this time around.